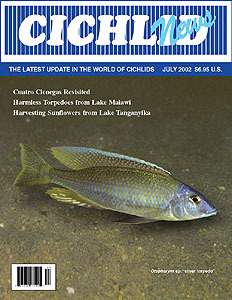 The Cichlids of Cuatro Cienegas by Martin Geerts. New evidence is evaluated in the multiple-species versus polymorphism controversy. Harmless Torpedoes by Ad Konings. Systematics and ecology of a poorly-known group of predators from Lake Malawi . Experiences with Pseudotropheus sp. “Red-top Ndumbi” by Jason Selong. Aquarium husbandry of a recently introduced “dwarf” from Lake Malawi. Breeding Neolamprologus gracilisby Dan Woodland. Aquarium observations of familial structure in a Tanganyikan cichlid.